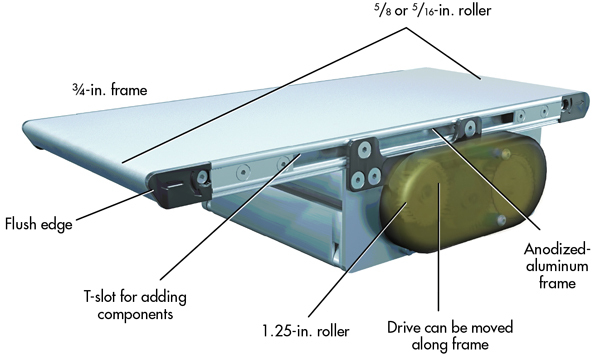 The 1100 Series conveyor platform from Dorner Mfg. Corp., Hartland, Wis., offers OEMs and factory owners the thinnest frame in North America. It measures just ¾-in. tall and can fit in tight spaces or free up room for other machines or workers. The conveyors have anodized-aluminum frames, FDA-approved plastic tail plates, and stainless-steel fasteners, letting it qualify for Clean Room Class 100 certification. This makes them suitable for medical, pharmaceutical, and life-science applications, as wells industrial use. You can read the entire article on page 14 of Machine Design’s current issue or on their website.